GlassesOff, the scientifically proven iOS app that improves your near vision sharpness, has officially launched in the App Store. We are excited to finally make this amazing scientific breakthrough available to the public and help people take control of their vision. If you are experiencing natural age-related changes when reading, then the GlassesOff app is ideal for you. The quality of an image captured by the eyes. The image processing capabilities of the brain as it interprets an image captured by the eyes. As we get older, the lenses of our eyes lose focusing power and that’s why our ability to capture images starts to deteriorate. The GlassesOff scientists have changed all this forever by developing a method to improve the image processing function in the visual cortex of the brain. It comes in the easy and simple form of an iPhone app that exercises your vision with game-like challenges. You should see results after following your personalized improvement program for approximately 3 months. Suitable candidates in our studies successfully reduced their “eye age” by an incredible 8.6 years on average. Go to the iPhone App Store. Install GlassesOff for just $9.99 & allow ‘push notifications’. Check the countdown display on the main screen to see your place on the waiting list. When it’s your turn to get started, you’ll receive an alert on your mobile. 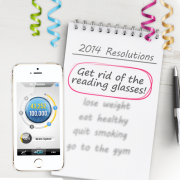 Complete the short evaluation and start your personalized GlassesOff program.